Firefighters battled a two-alarm blaze at a house in a Sunnyvale neighborhood Saturday night, according to officials. Marianne Favro reports. Firefighters battled a two-alarm blaze at a house in a Sunnyvale neighborhood Saturday night, according to officials. 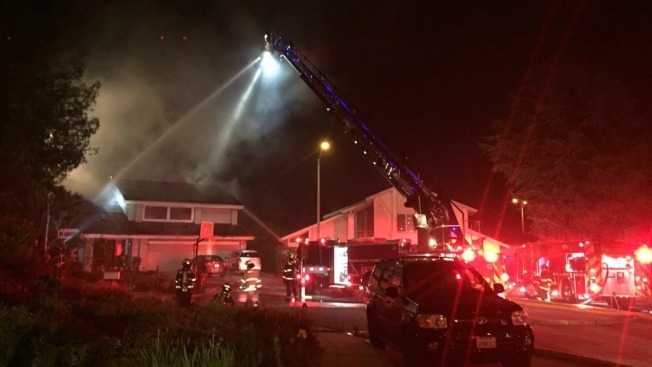 The fire, which pumped heavy smoke into the air, started burning at the home along Elsona Court near Astoria Drive around 7 p.m., officials said. As of 11 p.m., the fire had yet to be completely extinguished. A family was inside the house when the blaze ignited, but they were able to escape. One person suffered minor injuries, fire officials said. Firefighters were forced to fight the flames from extended ladders due to fears that the engulfed roof could collapse. Residents in the area were advised to keep their windows closed due to the heavy smoke. Others were asked to avoid the area. The blaze did not damage any surrounding homes, according to fire officials.